It may seem a strange topographic irony that the most famous mountain in Sri Lanka, an overwhelmingly Buddhist and Hindu island for well over two millennia, is known to the English-speaking world by a Muslim name, Adam's Peak. However, early Muslim connections with Sarandibl are quite well documented. At the summit of this granite pinnacle overlooking the gem district of Ratnapura is a stone impression claimed by Muslim tradition to have been created by the impact of Adam's foot as he fell to earth from the Garden of Eden. Located along a generalized Muslim pilgrimage route that stretches northward from the Arabian Sea ports of Galle and Weligama to the pinnacle of Adam's Peak lies the hermitage shrine of Daftar Jailani,2 where the Sufi saint, Sheikh Muhiyadeen Abdul Qadir Jilani (d. 1166 CE, in Baghdad), renowned throughout South Asia as the founder of the Qadiriya order, is by legend said to have meditated for twelve years after paying his respects to Śrī Pada, the Resplendant Foot. Despite opposition from conservative Islamic groups, Jailani today attracts large crowds of Tamil-speaking Muslim devotees to the annual kandoori festival, reflecting the surprising vitality and growth of popular Sufi devotionalism in Sri Lanka.3 However, in an island nation where sacred geography also maps hostile ethnic boundaries and 'homelands', the growth of the shrine at Jailani has also placed the Sri Lankan Muslims in a potential geo-religious zone of conflict with hostile elements of the Sinhala Buddhist majority. Jailani is situated at about 70 km from Adam's Peak, but the terrain is formidable. Roads daringly engineered by British tea planters wind part of the way upward from Ratnapura, 60 km away, and Maskeliya, the most convenient base for climbing the mountain, is a four hour drive from Jailani. Even more isolating is the ethnic and religious environment of the shrine: the nearest town is Balangoda, seat of a 96 per cent Sinhalese parliamentary constituency that encompasses the estate of the Ratwatte family, one of the leading twentieth century Sinhalese Buddhist political dynasties in the island. Unlike dargahs located in historic urban Muslim enclaves, such as Galle or Beruwala, or village mosques in the Muslim-dominated agricultural regions of the eastern coast, the shrine at Jailani lies serenely exposed at the edge of a dramatic granite escarpment 22 km southeast of Balangoda, flanked by wet-zone forested hills and surveying Sinhala Buddhist peasant resettlement projects on the Kaltota plain below. A small Muslim community of about thirty families has grown up in the vicinity, but relations with their Sinhala neighbours have been distant and at times hostile (Spencer 1990: 38-9, 50-1). It is a wildly beautiful location set midway up the Kandyan Hills, with a commanding, view southward toward the coast at Hambantota; a perfect site, it is said, for meditation and mystical gnosis. Although there are some tombs of local faqirs and holy men at Jailani, the place is not a mortuary shrine (dargah) but a hermitage, a place of saintly visitation and mystical meditation. 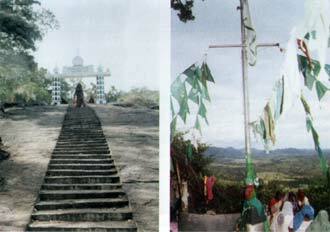 Although the modern Sinhalese and Tamil pilgrims who constitute the vast majority of devotees ascending the mountain each year identify it as the footprint of the Buddha or of the Hindu god, Siva, the fourteenth century Arab traveller Ibn Battuta reported that it also attracted a stream of Muslim pilgrims from the Middle East seeking contact with their primordial ancestor, Adam. Gem traders would also have been drawn to the vicinity of Adam's Peak because of its alluvial deposits of precious stones, but Ibn Battuta did encounter a party of Arab and Persian dervishes 'who had come from visiting the Foot' in the Maldive islands (Gibb 1986: 247). Battuta himself made the Adam's Peak pilgrimage soon after, en route to the South Indian city of Madurai. The Jailani site consists of a steep forested ravine surrounded by three bald granite outcroppings to which the Muslims have given Tamil names: Kappal Malai (ship mountain), Jin Malai (djinn or spirit mountain), and Curankam Malai (cave mountain). The largest and most dramatic of the stone formations is Kappal Malai, which is said to resemble the prow of a petrified ship, and tucked at the base of the rock is an open air mosque built in 1922 that is the centre of festival activities. The overhanging monolith is also referred to as Kaiyadi Malai (handprint mountain), because it is where the saint and his successors left their handprints in sandalwood paste. Jin Malai is a gentle stone slope with few cultural features apart from an early Arabic inscription6 and some Muslim flags, but with spectacular views of the Kandyan massif. Curankam Malai is the summit of a sheer granite cliff-face suspended high above the irrigated rice fields of Kaltota, and it is here one finds the cramped but panoramic cave cell where Muhiyadeen Abdul Qadir Jilani is believed to have meditated. Although Jailani is said to have been a place of Muslim refuge and Sufi meditation from the beginning of the fourth century of the Islamic era—and both a discovered dervish tombstone and some Arabic inscriptions would seem to support this view (Aboosally 2002)—all of the infrastructure of the Jailani shrine today is of twentieth century origin. The site was rediscovered in 1875 through the efforts of an Indian Muslim of Lakshadweep origin who subsequently married and settled in Balangoda. However, it is worth noting that the rediscovery of the Jailani site did not serve to charter an exclusive lineage of saintly caretaker-descendants, such as the hereditary saheb shareholders of Nagoor (Saheb 1998) or the pirzad-e families of the Nizamuddin Auliya Dargah in Delhi (Jeffery 1979). The mosque at the base of the rock remains the centre of the festival to this day. Indeed, almost no such established dargah-based elite lineages exist in Sri Lanka.7 Members of the small but prosperous Muslim merchant community in Balangoda began celebrating the Jailani festival annually from 1890, and in 1922 C.L.M. Marikar ('Balangoda Hajiyar') constructed the mosque at the base of the rock that remains the centre of the festival to this day. Seyed Mustafa Abdul Rahuman (Periya Bawa'), the Lakshadweep maulana who reopened Jailani to popular worship, is buried in a special ziyaram next to the Balangoda Jumma Mosque, and beside him lie his local patrons, Sinna Lebbe Cassim Lebbe and the latter's son, C.L.M. Marikar. The Lakshadweep saint's Balangoda-born son, Seyed Buhari, seems to have been a recognized figure in the 1920s, but he did not perpetuate a local saintly lineage. 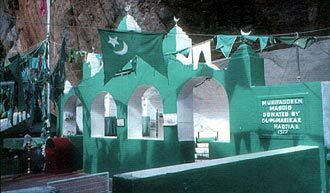 In addition to the cliffside cave ledge where Muhiyadeen Abdul Qadir Jilani is believed to have meditated, another key location is the china room,8 a small enclosed cave-cell built into the overhanging rock above the mosque where it is said the Sixteenth Century saint Shahul Hamid and his travelling companion Seyed Sahabdeen—whose ziyaram is at the Meera Maccam Mosque in Kandy—meditated in the company of Allah's 'green' servant al-Khidr during an astral journey from his shrine at Nagoor, Tamilnadu. When he returned to Nagoor, Shahul Hamid brought with him an iron chain originally used by Khidr (or, in another version, by the Macedonian hero, Dhul Qarnayn) to bind himself while performing severe austerities at Jailani. A distinctive 'shrinking chain' identified with this legend hangs from the ceiling in front of the tomb of Hazrat Yusuf Saheb, the miraculously conceived son of Shahul Hamid, at the Nagoor Dargah. During most of the year, Jailani is a tranquil place to visit, devoid of crowds, and conducive to solitary sightseeing and contemplation. But each year during the kandoori9 festival commemorating the death anniversary of the Iraqi saint—popularly known inTamil as Muhiyadeen Andavar (Lord Muhiyadeen)—the site fills with Muslim pilgrims from all parts of the island and loudspeakers echo with amplified singing and recitation. During both the inaugural flag raising ceremony and the concluding feast day, the pilgrim shelters are packed; most devotees sleep under the open sky on the plaza, along the footpaths, or under the trees and boulders that surround the central mosque. Tea stalls and eating establishments are crowded, souvenir boutiques cater to pilgrims with children, and the itinerant Bawa faqirs are conspicuously installed in their headquarters at the confluence of two walkways leading to the shrine. It is hard to move freely without stepping on some family's sleeping mat or bumping into spectators watching a devotional or curing performance of some kind. The crowd is patient and good-natured; kinship groups remain surprisingly relaxed as they sit jammed together shoulder-to-shoulder. Jailani also affords an opportunity for some rude high-jinks by the children and for some flirtation between large roving groups of young people. And above it all, from dawn until midnight, the loudspeaker crackles and blares, carrying a steady stream of announcements interspersed with a variety of Muslim recitations, recordings, and ratibs. The opening event of the festival is an all-female recitation of the Talai Fatiha,10 an intercessory prayer to the wives of the earlier Prophets and to the Prophet Mohammed's daughter Fatima especially composed for the Muslim women of Sri Lanka by the influential nineteenth century South Indian missionary scholar from Kilakkarai known popularly as Mappillai Lebbe Alim (Shu'ayb Alim 1993: 613). The fact that a women's event is first on the programme seems to set a tone of gender equality and co-participation that is felt throughout the festival, despite spatial separation of the sexes within the Jailani mosque itself.11 However, from the standpoint of sheer religious excitement, it is the late afternoon flag raising ceremony that truly inaugurates the Jailani festival and is the highlight of the entire month-long event. A flag raising ceremony (kodiyerram) is a standard feature of Hindu temple and Christian church festivals in Sri Lanka, but flags appear to be especially prominent at Muslim shrines and celebrations. Many pilgrims to Jailani bring with them, or purchase at the site, green pennants.with star and crescent markings that they affix to cords and ropes hanging in the mosque, or tie to flagpoles that have been erected on the rocky outcroppings that surround the shrine. The Bawa faqirs stage their own special flag raising ceremony directly in front of their headquarters near the bazaar junction. 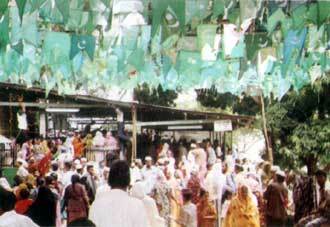 However, it is the consecration and raising of the main mosque flag that generates the greatest anticipation and religious tension among the pilgrims, for it is believed to embody the sacred power or barakat of Muhiyadeen Abdul Qadir Jilani, reinforced by the spiritual echo of his latter day follower, the saint of Nagoor. As sunset approaches, a tense crowd waits at the foot of the stairway leading upward to the rock-enclosed chilla room softly intoning the supplicatory invocation, 'muradiya, muradiya, Sheikh Muhiyadeen muradiya12...' while the Chief Trustee and a select group of religious men, honoured guests, and major patrons crowd into the small chamber where the flag will be consecrated. After a swelling barrage of Arabic invocations by the kateeb of the Jailani mosque, the Chief Trustee dips his hands into a bowl of sandalwood paste and places his palm prints on the green embroidered satin flag. What instantly follows is something like a rugby scrum, with everyone else inside the tightly packed room struggling forward to touch the remaining sandalwood paste and the flag itself. After the banner is affixed tightly to a portable wooden pole, a team of muscular men led by the Chief Trustee carry it above their heads from the chilla room to the central flagstaff in the mosque, while members of the waiting crowd eagerly jostle and lunge forward to touch the divinely-charged flag as it passes. While everyone is liberally sprinkled with rosewater, the flag crew struggles with pilgrims who impede the hoisting of the flag, seeking to touch it before it is out of reach. In the process, several men fall into a state of religious trance (hal, jadab), some of whom are carried back up into the chilla room to recover. Women are affected by the divine power of the occasion, too. One prominent female curer known as Kaiyamma is kept busy near the Dervish tomb exorcising malevolent spirits from an array of female patients who range from teenage girls to elderly women. Once the main flag has been hoisted, most of the crowd relaxes and returns to a variety of personal devotional activities. Inside the mosque, members of the staff assist pilgrims in fastening their individual green pennants, and a steady stream of women signal their vows by tying strips of cloth containing small coins (kanikka), and taking away curative spoonfuls of oil, from a massive brass oil lamp just inside the threshold of the building. In the evening after the flag raising, and on many subsequent nights of the festival, different groups recite mauloods and perform ratibs14 that celebrate the lives and miracles of the most popular saints. To commemorate the flag raising on 22 June 2001 (the first day of Rabi ul-Akhir), a group of Sufi laymen from Welimada in the central hills performed a carefully rehearsed and choreographed performance of a Rifai ratib in the central mosque at Jailani starting around 9 pm. Like other ratibs I have witnessed, this performance was staged by two opposing rows of seated men, each with a tambourine (dahira, or daf), under the leadership of a Kalifa who sang the opening lines and prompted the seated members to respond. The singing started slowly and gradually picked up in tempo until it reached a highly emotional crescendo, accompanied by rapid tambourine rhythms and energetic body movements in perfect unison. Sung in a mixture of Arabic and Urdu, a Rifai ratib first recounts the silsila, or spiritual genealogy, of the tariqa back to its founder, Hazrat Ahmad Kabir Rifai, followed by songs and prayers celebrating the saint's exemplary life and miraculous powers. 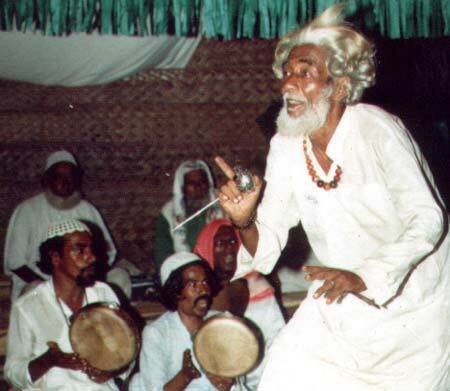 This distinctive genre of Sufi singing has been introduced from Androth Island in the Lakshadweep archipelago by travelling Rifai tangals who have initiated many followers in Sri Lanka over the past 150 years. The laymen's Rifai ratib is a rather mournful form of devotional singing, not the sort of thing that will hold the attention of a restless crowd for very long, particularly when more theatrical feats are being staged nearby. Concurrent with the lay Rifai ratib, a professional ratib staged by the itinerant Bawas attracts a much larger crowd of onlookers in front of their headquarters near the bazaar junction. Because the Bawas are members of the Rifai order, their zikr performance is also called a Rifai ratib, but its content and focus differs markedly.16 It consists of a circle of 15 or 20 Bawas led by a main Kalifa and several junior Kalifas, all of whom loudly beat tambourines and shout Muslim invocations (e.g. the declaration of faith; la illaha Wallah... ) while three or four Bawas take turns performing ecstatic acts of self-mortification as the crowd looks on. After some preliminary singing and a short sermon on the power of the auliyas (saints), the first Bawa selects one or more weapons from a large array of daggers, needles, and spikes laid out at the centre of the group. He then presents the implement to his Kalifa for his blessing, which is bestowed by means of verbal invocation and by lightly wetting the tip of the weapon with saliva taken with a swipe of the thumb from deep within the, roof of the mouth. Then, accompanied by rhythmic chanting and drumming and copious amounts of incense, the Bawa works himself into a religious trance-like state that may move him to repeatedly slash his chest or tongue with a knife, or perforate his skin with long steel needles, or jab dabus spikes with distinctive chain-adorned spherical knobs—similar to those found in Rifai communities stretching from the Balkans to Indonesia—into his skull or his eye sockets. At the conclusion of each individual, performance, the Bawa returns to the feet of the Kalifa to receive additional blessings, handshakes, and anointment of his wounds-with his. Kalifa's saliva. This twenty-first Century Rifai ratib is quite similar to those reported from Kataragama, Kalkudah, and Colombo in the 1930s (Spittel 1933: 312-21) and to Bawa ratibs I attended on the east coast in the 1970s (McGilvray 1988). At the end of each nightly demonstration the Kalifas lead the Bawas in a series of catchy popular Muslim devotional songs while members of the audience are encouraged to step forward to donate money to the Bawa troupe. The Bawa exhibition concludes by midnight, and family groups then retire to their makeshift sleeping areas for the night. The Jailani festival lasts for a full month, with an intermittent and less intense schedule of mauloods and ratibs of the sort described during the opening day. The Bawas remain encamped throughout, performing whenever they can attract an audience, but attendance is thinner during the mid-weeks of the festival. The number of pilgrims rises steeply again on the final two days of the festival, the kandoori feast proper, when the kitchen at the shrine serves up huge quantities of food to the pilgrims. From mid-afternoon until noon of the following day, the shrine is alive with a constant stream of amplified prayers, mauloods, fatihas, ratibs, and discourses on Hadith. When I attended the final day celebrations in July 2001, lay groups from various parts of the island performed ratibs from different Sufi orders, including Jalaliya, Idroosiya, Qadiriya, and Rifai.17 A Colombo-based middle class group known as Hubbul Auliya (Love of the Saints) took the opportunity to conspicuously demonstrate its mystical devotion and philanthropy by donating a special calligraphed flag to the shrine. Some of the more intrepid pilgrims negotiated an arduous footpath to the Uppu Kulam (salt pond), a small mineral spring under the overhanging stone cliff where Muhiyadeen Abdul Qadir Jilani meditated. All three of the monolithic formations that surround the Jailani shrine were dotted with strolling groups of pilgrims, either ascending or descending, from dawn to dusk. The temporary souvenir boutiques and tea stalls carried on a thriving business, and individual traders laid out for sale a wide array of Islamic literature, prayer beads, inscribed Quranic amulets, and scented oils. The specially-prepared kandoori food, served on the final night and once again at noon on the final day, consisted of six-person servings of rice, peas, lentils, and either beef or chicken. There was perhaps less anticipation and theatrical excitement than at the inaugural flag raising ceremony, but the final meal itself seemed to be strongly imbued with sacred meaning for the pilgrims who consumed it. Although they are small establishments relative to Sri Lanka's major urban mosques, four sites can be readily identified as the island's most well-known Sufi-centred pilgrimage shrines. In addition to Daftar Jailani, there is the dargah of Faqir Muhiyadeen at Porvai (Godapitiya) near the southern town of Akuressa. In the nineteenth century, the saint revealed himself in a dream to two Muslim businessmen from Galle to be a mendicant avatar of Muhiyadeen Abdul Qadir Jilani. Like Daftar Jailani, the Porvai Dargah is situated in a Sinhalese majority area, and it had to be rebuilt (with help from the British colonial government) after suffering extensive damage in the Sinhalese-Muslim riots of 1915. 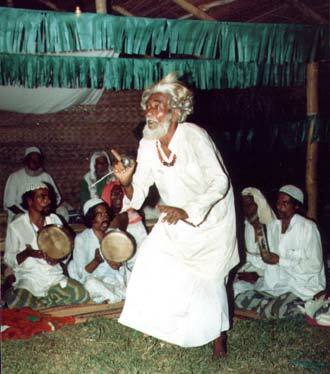 The southern coastal towns of Weligama and Matara, only 20 km away, are historic centres of Rifai Sufi allegiance, and the annual festival at Porvai features a strong Rifai presence, including ecstatic 'cutting and stabbing' (vettukkuttu) performances by itinerant Bawas from the east coast and sometimes by lay Rifai Sufis as well. Because both Daftar Jailani and Porvai celebrate the death anniversary of the same saint, the two establishments have worked out a coordinated festival calendar that allows both festivals to take place within the same time frame. The third major Sri Lankan Sufi pilgrimage shrine is the Beach Mosque (Katarkaraippalli) located at Kalmunaikkudy in Amparai District on the east coast of the island. This is an empty or virtual dargah—a 'branch office' as local people explained tome in English—of the sixteenth century saint Hazrat Seyid Abdul Qadir Shahul Hamid whose 'head office' tomb is located at Nagoor on the Tamilnadu coast near Nagappattinam.According to local sources, the Beach Mosque shrine was founded by an early nineteenth century South Indian Muslim trader from Kayalpattinam, Muhammad Tambi Lebbe, who was miraculously cured of leprosy at the beach when the Nagoor saint appeared in a vision and instructed him to drink a special mixture of lime juice and sea water. Like similar 'branch office' dargahs in Singapore, Penang, and South India, the Beach Mosque celebrates the Nagoor saint's annual festival according to precisely the same ritual calendar, starting with a flag raising ceremony that coincides exactly with the flag raising at Nagoor. A unique feature, however, is the board of matriclan (kuti) elders who administer the Beach Mosque in accordance with the matrilineal and matrilocal social system common to Muslims and Hindus in this region, of the island (McGilvray 1982, 1989, 1998). The Beach Mosque, too, is a major venue for the Bawas; in fact, it is the site of their annual general meeting presided over by the current head of the island-wide Bawa jamat, Dr Pakeer Jaufar, Ph.D. and Sar Kalifa, a Lecturer in Education at the Open University in Colombo. Below: Illustrious visitors to Kataragama include H.H. 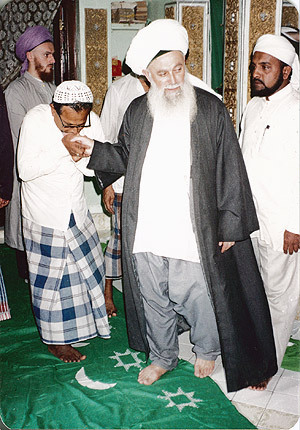 Sheikh Nazim Adil al-Haqqani of Cyprus and murids, seen here within Khidr Maqaam. A focus on the saints Muhiyadeen Abdul Qadir Jilani (Muhiyadeen Andavar) and Shahul Hamid (Nagoor Andavar) is deeply rooted in Sri Lankan popular Islam. The legends of Daftar Jailani say these two saints combined forces with the scriptural 'green' Prophet 17—the mysterious servant of Allah also known as Hayat Nabi, an advisor to Moses, who is believed to have a special connection with the world of nature and with the fountain of immortality—and the heroic figure, Dhul Qarnayn (Two Horns), an Islamic transformation of Alexander the Great. 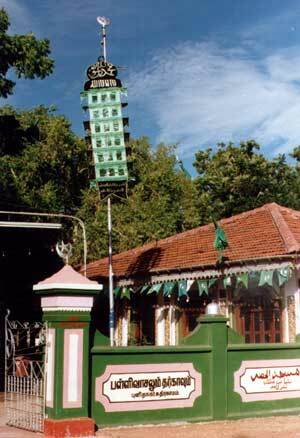 There is an annual celebration at Jailani in the month of Safar solely in honour of Khidr at which niyattu,18 a special form of milk-rice containing extra sugar and raisins, is cooked and distributed at the base of a Khidr flagpole on the eastern parapet overlooking the Kaltota plain and the forested hills to the east. People say that Jailani is the sort of wild location conducive to encountering Khidr, an event that is believed to have occurred when the Baghdad saint, and later the Nagoor saint, visited the site during their astral travels. However, the Sri Lankan shrine that is most fully dedicated to Khidr is the fourth of the major Sufi sites in the island: Kataragama. While ethnographic attention has focused upon the expanding island-wide Sinhalese and Tamil cult of Kataragama, a Sri Lankan name for the Hindu god, Skanda or Murugan (Obeyesekere 1977, 1978), the Muslim enclave at the Kataragama pilgrimage centre located north of Tissamaharama has also steadily grown over the past century. Muslim oral traditions identify the southeastern quarter of the island as the 'Khidr region' (Hassan 1968: 5). The present day Khidr Taikkya at Kataragama has been steadily enlarged as the centerpiece of a Muslim compound containing the tombs of several north Indian or central Asian faqirs who resided at Kataragama to commune with Khidr.19 One ecumenical Western devotee has even argued that Kataragama is actually Khadir-gama; based on an alternative spelling of Khidr (Harrigan 1998: 109). Another version of the Jailani legend contends that the Nagoor saint was invested with the cloak and title of Qutbul Aktab at Kataragama (Hassan 1968:11). The Bawas make their seasonal appearance here as well, performing their penetrating zikr in the area in front of the tomb of the austere vegetarian saint known as Palkudi (milk-drinking) Bawa. A problem of litigious micro-politics is common to religious establishments throughout South Asia, and some of the Sri Lankan Sufi shrines discussed here have suffered their share of managerial conflicts, succession quarrels, and property disputes. A privately published booklet19 devotes nearly a third of its pages to recounting the mid-twentieth century succession battles and court cases that determined legal control of the shrine (Hassan 1968). At Jailani, too, there was a lengthy lawsuit filed in 1922 to remove a usurping Indian mastan who had been charging pilgrims an entrance fee, and in the early 1970s the government filed a case against a faqir named Trinco Bawa for erecting a shelter at Jailani in defiance of the Antiquities Ordinance (Aboosally 2002). Throughout the Twentieth Century it has been the members of one family, descendants of a leading Muslim physician who settled in Balangoda in the nineteenth century, who have been leaders in protecting and promoting the development of Jailani as a Sufi shrine. In conversations with the current Chief Trustee, Mr M.L.M. Aboosally, a retired MP and former government minister, I learned that Jailani has been a target of criticism from Islamic reformist groups, such as the Tabliq, Jamat-i-Islami, and Towheed movements, who preach that Sufi mysticism devalues the fundamental Sharia requirements and that personal devotion to the saints amounts to shirk or idolatry. However, on my visits to Jailani in 2001 and 2002, I observed no public opposition to the festival and no printed literature from Islamic fundamentalist groups. Mr Aboosally says he has dealt with them repeatedly in the past, however, pointing out that Muslims are free to stop attending Jailani whenever they wish. As long as pilgrims continue to come, he feels the shrine serves a religious need in the Sri Lankan Muslim community. Aboosally is a liberal-minded person, but there is little doubt that his stature as a highly successful retired politician, and as a member of one of Balangoda's leading Muslim families, has given him some needed leverage in this situation. For their part, the Islamic reformists can discount Jailani as an exotic rural side-show, a place where Sufi devotionalism is performed far from the urban gaze. The contrast was stark when I stopped in Balangoda town to visit the Periya Bawa ziyaram, tomb of Seyed Mustafa Abdul Rahuman from Lakshadweep and his two local patrons, a small neglected masonry structure overshadowed by the vast modern extension of the Jumma Mosque located immediately adjacent. On the walls of the new mosque were posted notices written in Tamil announcing meetings and sermons by visiting Islamic reformist speakers under the sponsorship of the Towheed movement. Inquiring about events at the Periya Bawa ziyaram, I learned that the annual kandoori for the local Balangoda saint has not been celebrated for several years because of opposition from a small but highly vocal fundamentalist faction. It is not the fundamentalists, however, who have posed the most serious threat to the future of Jailani. It was pointed out earlier that Jailani is located in an overwhelmingly Sinhala Buddhist district and that the shrine itself is separated from the Muslim community in Balangoda by 22 km of serpentine road. 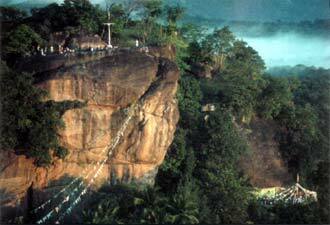 Adam's Peak is revered by some Muslims, but it is much more sacred today to the Buddhists and the Hindus. Jailani, however, is an exclusively Muslim shrine patronized by the small yet conspicuously prosperous community of Muslim traders and gem dealers in Balangoda, a town located deep in the hinterlands of Dhamma Dipa, the island consecrated to preserving the Buddha's message. During the kandoori festival, Jailani is suddenly flooded with Muslims from all over the island who have no connection to the Balangoda region. In the early 1970s, Jailani began to attract the attention of Sinhala chauvinists and politicized members of the Buddhist sangha as a seeming violation of the island's sacred geography, a religio-spatial error that might be rectified, they thought, with the help of the state Archaeology Department. It is important to note that, while intermittent political friction and communal strife between Sri Lanka's Tamil Hindus and their Tamil-speaking Muslim neighbours in the Eastern Province has always been recognized as a significant and growing problem, especially in the context of the Eelam secessionist conflict, a more submerged but equally dangerous ethnic antagonism has long existed between the Sinhalese Buddhists and the Muslims. Entrenched memories of the traumatic 1915 Sinhalese-Muslim riots can account for much of the Twentieth Century Muslim political opportunism that Tamil nationalists have considered so disloyal to their Dravidian cultural mission. Because two-thirds of Sri Lanka's Muslim minority live in Colombo and in the Sinhalese towns of the central and southwestern provinces, they are acutely aware of their vulnerability, a fact that has separated them from the more secure Muslim farmers of the eastern coastal districts (McGilvray 1998). Sudden outbreaks of violence against Muslims in Sinhalese towns like Mawanella in recent years have shown that these underlying ethnic embers can easily be fanned into flame. One such potential flashpoint arose in 1971 during the SLFP government of Mrs Sirimavo Bandaranaike, herself a member of the powerful, aristocratic Ratwatte family from Balangoda. According to Mr Aboosally, who was the man on the spot, a Muslim petition that had been filed back in the 1940s to obtain permanent legal title to the property at Jailani was eventually denied by the government twenty years later, offering them only a permanent lease. Then, in the context of local political rivalries, a claim was put forward in the early 1970s that Jailani was actually an ancient Buddhist archaeological site requiring urgent government protection and preservation. Abruptly, the Ministry of Cultural Affairs authorized the Archaeology Department to 'reconstruct' a small Buddhist dagoba at the summit of Curangam Malai directly above the cave where Muyihadeen Abdul Qadir Jilani is said to have meditated for twelve years, and a Buddhist reclamation of the site seemed imminent. By means of high-level counter-politics, construction of the Buddhist dagoba—using locally fired bricks and Kankesanturai cement from Jaffna—was stopped when the Jailani trustees obtained a cabinet order capping the Construction at a height of two feet. Archaeologically stalemated, the proponents of a Sinhala Buddhist take-over of the shrine, including an activist monk from Ratnapura and some members of the Ministry of Cultural Affairs, put together a high-level delegation and demanded to 'inspect' the Jailani site. According to Aboosally's account, the assembled crowd included 30-40 monks from Ratnapura along with their lay supporters, the Cultural Affairs Minister, the Commissioner of Archaeology, and the ruling party MP for Balangoda, Mrs Mallika Ratwatte. With army personnel in position as well, the situation could have become violent if the Muslims had tried to defend their territory by force, but an ugly incident was averted by keeping most of the local Muslims away. On behalf of the Jailani mosque, Mr Aboosally strategically provided all the Buddhist monks with dana (ritual presentation of food), and the only violence was a sharp verbal exchange between Mr Aboosally and Mrs Ratwatte. The conflict was finally resolved at the Prime Minister's level, when the Minister of Education (a Muslim) succeeded in persuading the rest of the cabinet to leave the trustees in possession of Jailani. The trustees, for their part, agreed to have the Jailani site gazetted under the Antiquities Ordinance. They also promised to strictly limit any future construction of buildings, and—to reassure the authorities that an expanding dargah-necropolis was not envisioned—they agreed to prohibit all further Muslim burials at the sacred site (Aboosally 2002 and personal interviews). However, the Muslims at Jailani have since learned something about the symbolic value of rock carving, or what we might call 'lithic politics'. 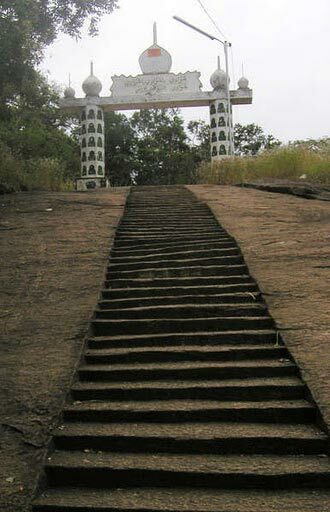 In 1984, a wealthy Muslim donor from Chilaw made it possible for the trustees to hire a local mason to cut an impressive stairway from the living rock leading into the Jailani sacred area, much as the ancient Sinhala kings of Anuradhapura carved, steps from the rock at Mihintale to commemorate the conversion of the island to Buddhism. These newly carved steps at Jailani, much more than the Islamic-style arch that frames them, speak the language of religious antiquity and sacred archaeology so popular in Sri Lanka today. They are obviously intended to vouchsafe the footsteps of future Muslim pilgrims to the shrine of Daftar Jailani. Sarandib was the common Arabic name for the island in the medieval period. Muslims form nearly 8 percent of the Sri Lankan population. The vast majority of these are Tamil-speaking Sunni Muslims (Sri Lankan Moors) of maritime Indo-Arab origin and who belong to the Shafi legal school. There are also small groups of Muslim Malay and Muslim Gujarati communities. For a cultural and historical overview, see McGilvray 1998. For a compendium of historical citations of Adam's Peak, see Aksland 2001. Completing the idealized topography of Muslim pilgrimage to Sri Lanka and South India is the chain of small reefs and islands known as Adam's Bridge, stretching across the Palk Strait from Talaimannar in Sri Lanka to Ramesvaram in Tamilnadu. The tomb of Habil, a son of Adam, is said to be located half a kilometre from the Ramesvaram railway station (Shu'ayb Aiim 1993:3 fn. 5). The words have been translated as 'Ya Allah Hijri 300' or 907 CE (Aboosally 2002: 61, 87). A partial exception may be the descendants of Sheikh Mustafa, a nineteenth century Sri Lankan designated to be the hereditary successor of the Yemeni saint Mubarak Maulana. The current hereditary leader of the Mustafaviya order has a comfortable private enclave in Beruwala, although the founders of his order are buried elsewhere. Chilla refers to a 40-day Sufi retreat, or to the place of seclusion where it occurs. Tamil, kanturi, a word meaning 'tablecloth' in Persian. The Arabic term urs is seldom used in Sri Lanka. The head or first fatiha. I would speculate that the assertiveness and independence of mind shown by the Chief Trustee's wife, an educated woman from the matrilineal east coast town of Kalmunai, may have had an impact on the way women are currently incorporated into the Jailani celebrations. Arabic, muradiyat. Fulfillment of one's spiritual wishes or desires. Lit. Tamil kidaku, cadjan or dried palm frond. Arabic ratib, 'that which is fixed.' A Muslim devotional performance, such as a zikr. At Jailani in 2001, the Bawas had a lay patron, a businessman from the Colombo Pettah with strong Sufi ties, who provided them with food supplies throughout the entire festival. 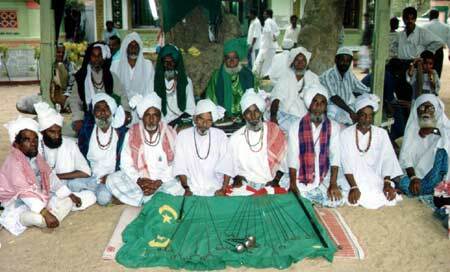 There are lay members of the Rifai order at places such as Kappuwatte and Pallimulla on the south coast who perform a self-mortifying zikr similar to that of the Bawas, in conjunction with the more devotional form of Rifai ratib. 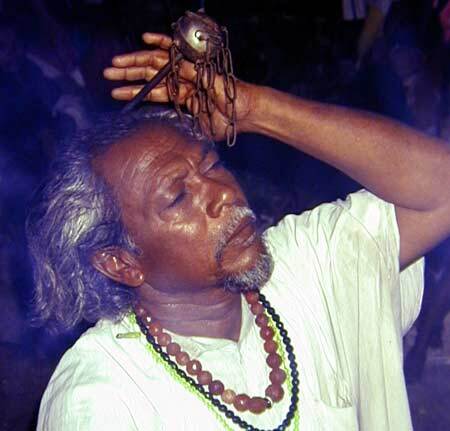 The Shaduliya tariqa did not appear on the published programme in 2001 and 2002, despite being one of the largest lay Sufi orders in southwestern coastal towns such as Beruwala and Galle. The literal meaning is 'intention,' but by metaphorical extension it means a kind of food offered with the intention of seeking divine assistance. Several energetic twentieth century chief trustees have built up the Kataragama Khidr shrine. This includes the current trustee, Mr M.H.A. Gaffar of Galle Fort. There are Brahmi inscriptions at Jailani dating to the second century aca, but they appear to assert territorial claims by local political chieftains. According to Aboosally (2002: 62-3) there is no evidence that the site was ever dedicated to the Buddhist Sangha. Aboosally, M.L.M. 1975. "Did Shayk Abdul Kader Jilani Visit Adam's Peak in Sri Lanka?" The Muslim Digest (South Africa), September-October, 167-70. ________ 2002. Dafther Jailany: A Historical Account of the Dafther Jailani Rock Cave Mosque, Sharm Aboosally, Colombo. Aksland, Markus. 2001. The Sacred Footprint: A Cultural History of Adam's Peak, Orchid Press, Bangkok. Gibb, H.A.R. (trans.). 1986. Ibn Battuta: Travels in Asia and Africa 1325-1354, Oriental Books Reprint Corporation, New Delhi. Originally published by Routledge & Kegan Paul, London, 1929. Harrigan, Patrick. 1998. Kataragama the Mystery Shrine, Institute of Asian Studies, Chennai. Hassan, M.C.A. 1968. Kataragama Mosque and Shrine, S.A.M. Thauoos, Colombo. Jeffery, Patricia. 1979. Frogs in a Indian Women in Purdah, Zed Press, Routledge, London and New York. McGilvray, Dennis B. 1982. "Mukkuvar Vannimai: Tamil Caste and Magician Ideology in Batticaloa, Sri Lanka", in D.B. McGilvray (Ed. ), Caste Ideology and Interaction, Cambridge University Press, 34-97. ________ 1988. "Village Sufism in Sri Lanka: An Ethnographic Report, Lettre d'Information" 8:1-12 (January 1988). Programme de Recherches Interdisciplinaires sur le Monde Musulman Peripherique, Centre d'Etudes de l'Inde et de l'Asie du Sud. Paris: EHESS. ________ 1989. "Households in Akkaraipattu: Dowry and Domestic Organization among the Matrilineal Tamils and Moors of Sri Lanka", in John Grey and David Mearns (Eds), Society from the Inside-Out:Anthropological Perspectives on the South Asian Household, Sage, New Delhi, 192-235. ________ 1998. "Arabs, Moors, and Muslims: Sri Lankan Muslim Ethnicity in Regional Perspective, Contributions to Indian Sociology" 32(2): 433-83. (Reprinted in V. Das, D. Gupta, and P. Uberoi (Eds), Tradition, Pluralism, and Identity: In Honour of T.N. Madan, Sage, New Delhi, 1999. Reprinted slightly abridged in T.N. Madan (Ed. ), Muslim Communities of South Asia. 3rd edition. Manohar, New Delhi, 2001. Obeyesekere, Gananath. 1977. "Social Change and the Deities: The Rise of the Kataragama Cult in Modern Sri Lanka", Man, n.s., 12: 377-96. ________ 1978. "The Firewalkers of Kataragarna: The Rise of Bhakti Religiosity in Buddhist Sri Lanka". Journal of Asian Studies 36: 457-76. Saheb, S.A.A. 1998. "A Festival of Flags: Hindu-Muslim Devotion and the Sacralizing of Localism at the Shrine of Nagore-e-Sharif in Tamil Nadu", in Pnina Werbner and Helene Basu (Eds), Embodying Charisma: Modernity, Locality and the Performance of Emotion in Sufi Cults, Routledge, London and New York, 55-76. Shu'ayb Alim, Takya. 1993. Arabic, Arwi and Persian in Sarandib and Tamil Nadu, Imamul Arus Trust, Madras. Spencer, Jonathan. 1990. A Sinhala Village in a Time of Trouble: Politics and Change in Rural Sri Lanka, Oxford University Press, Delhi. Spittel, R.L. 1933. Far Off Things, Colombo Apothecaries Co. Ltd., Colombo.